It wasn’t always pretty, but at this time of year, the bottom line is winning. It wasn’t always pretty, but at this time of year, the bottom line is winning. On a day where all the top four teams struggled at various times -- some a lot more than others -- Clemson did just that, beating South Carolina, 56-35. Defeating one’s biggest rival is always sweet, and the Tigers have now done it five years in a row. 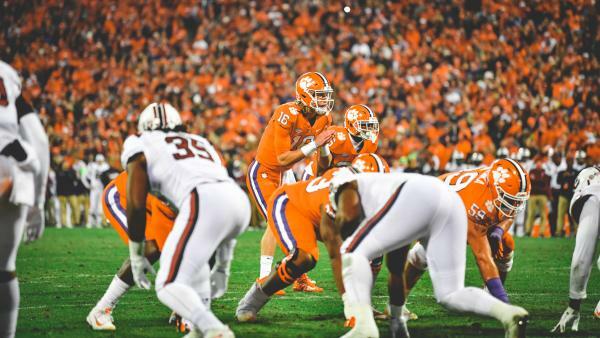 Clemson will have things to work on defensively before presumably playing in the College Football Playoffs, but offensively, it’s hard to find a team more explosive right now than the Tigers. Freshman quarterback Trevor Lawrence was again spectacular, throwing for 393 yards during his first appearance in this rivalry game. He only tossed one touchdown, but he let that score be known to his rivals. After throwing a 22-yard score to Tee Higgins late in the first quarter, Lawrence stared down the South Carolina bench, displaying the swag Clemson has been playing with all season. His athleticism and arm strength are certainly incredible, but Lawrence’s confidence is why the Tigers stand a chance against Alabama or anyone else they might play in December. The Clemson offense scored touchdowns on its first four drives, and then three more touchdowns on each of its first three series’ of the second half. It didn’t matter where the offense started its drives, the Tigers were going to score. Lawrence orchestrated 98, 97 and 95-yard touchdown drives. The long fields helped Clemson post 744 offensive yards and come within 12 yards of the school record, which has stood since 1981. As great as Lawrence was, the Tigers rushing attack was perhaps even better. Clemson averaged 6.4 yards per carry and posted 351 yards. This was the third time in the last seven games the Tigers eclipsed the 350-yard mark on the ground. Most impressively, Clemson scored seven times on the ground. Adam Choice led the way with three touchdowns, but Travis Etienne also had multiple scores with two, and Tavien Feaster added another. Even defensive lineman Christian Wilkins joined the fun, rushing for a two-yard score. While Etienne led the way with 150 rushing yards and set a program record with his 19th rushing touchdown this season, it was fitting for Choice to lead the team in scores Saturday. Choice is part of a senior class that heads into the postseason with a 52-4 record, including 27-1 at home. The Alabama 2017 senior class is the only one to finish with more wins. Defensively, Clemson doesn’t head into December without question marks. The Tigers sacked South Carolina quarterback Jake Bentley three times, but when they didn’t get pressure, Bentley took advantage of bad breakdowns in coverage. Bentley finished the night with 510 passing yards and five touchdowns. Two of his five scores were big plays of more than 65 yards. Some of that yardage was against the Clemson backups, as Dabo Swinney took out his defensive starters midway through the fourth quarter. But with just under five minutes remaining, South Carolina recovered a Clemson fumble. That made Swinney nervous enough to put his starters back into the game, and they gave up yet another score. The 35 points Clemson allowed is the most this season. Against two SEC opponents, the Tigers yielded an average of 30.5 points per game. That’s not going to quite any critics that say Clemson benefitted from playing an extremely weak ACC this year. But in the end, this may end up just being a motivation tool. This gives Swinney and his coaching staff something to work on before facing perhaps an even tougher SEC opponent in late December. Before that, though, Clemson’s incredible senior class will get a chance to avenge that one loss they suffered at home in the last four years when they face the Pitt Panthers in the ACC Championship next week. Pitt was a no show against Miami on Saturday, falling to the Hurricanes, 24-3. The Panthers better bring a lot more offense to Charlotte next week. The way Lawrence and his running game is operating, Clemson could start a drive in the parking lot, and the Tigers would probably find the end zone.